Have you ever driven past Cook’s and Ham’s Stations on Highway 88, and wanted to know their stories? 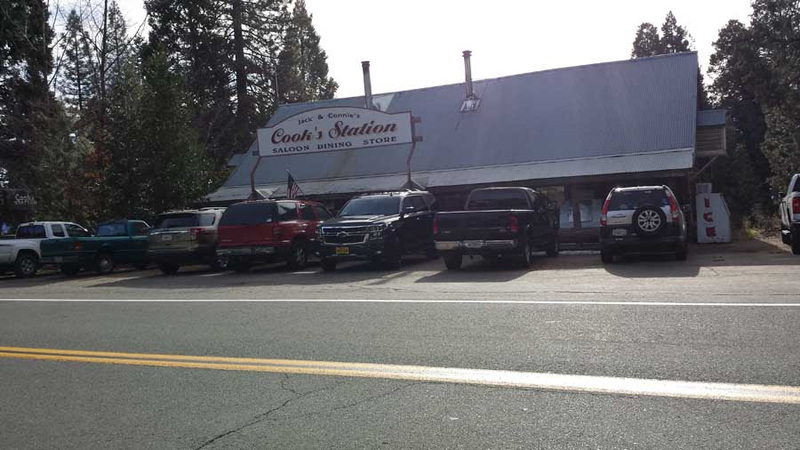 Cook’s Station (150 years old and counting) is still a popular wayside eatery. The “Volcano Cut-Off” had ferried travelers from the Old Emigrant Road in this direction since 1852. 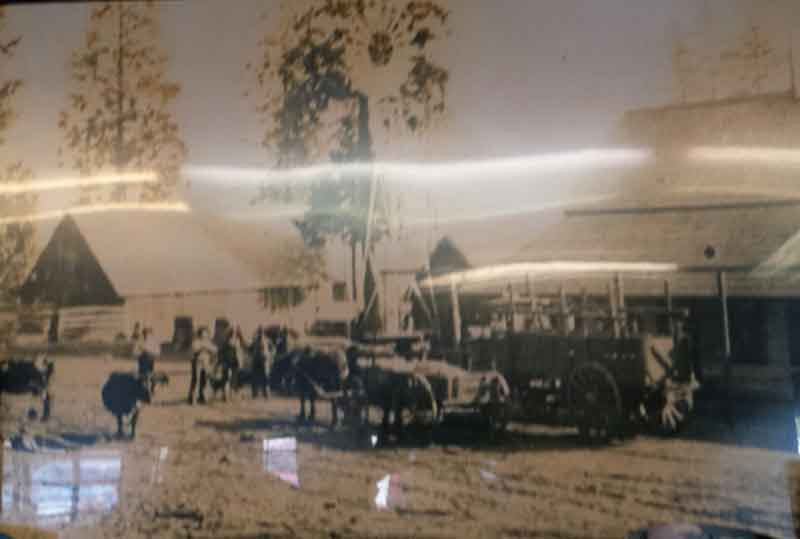 Then in 1862, Amador voters approved a $25,000 bond to finance a new and improved wagon road to the Amador county seat of Jackson — and it was to be a new toll road, mind you! 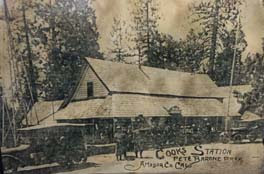 Happy travelers stopping at Cook’s Station about 1920, when Pete Barone was manager. 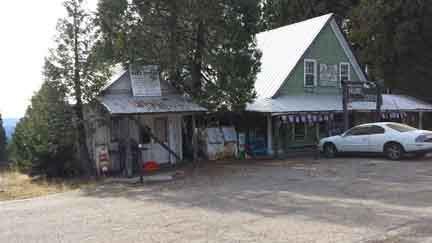 The merchants in Jackson were understandably in favor of this new enterprise, which would make it easier for traffic to reach the county seat. Yes, the new route was to be a toll road. But its advantages were substantial. For one thing it cut around the Carson Spur, allowing travelers to skip the arduous climb over West Pass. And as a new (and very expensive) roadbed, the going would be far better than the previous road. As Amador historian Larry Cenotto put it, “Roadside inns, like weeds, sprang up in anticipation” of the new wagon road’s opening! By the summer of 1863, the new “Amador and Nevada Wagon Road” was open for business. With its start at Antelope Springs (Dewdrop), it continued east as far as Hope Valley (still part of Amador County until the following year). The original establishment at the site now known as Cook’s Station was an inn owned by Charley Stedham (sometimes spelled Steadham), which opened as early as 1852 to serve travelers heading to Volcano. The way station went through several owners after Charley, becoming first Hipkin’s, then Wiley’s, and eventually Cook’s. Sometime after 1905, the old way station was acquired by Louis H. Cook. A resident of Volcano, Cook served as an Amador County supervisor and also road superintendent for the section of state road west of Kirkwood’s. In addition to owning this famous wayside stop that now bears his name, Cook also was proprietor of the St. George Hotel in Volcano. 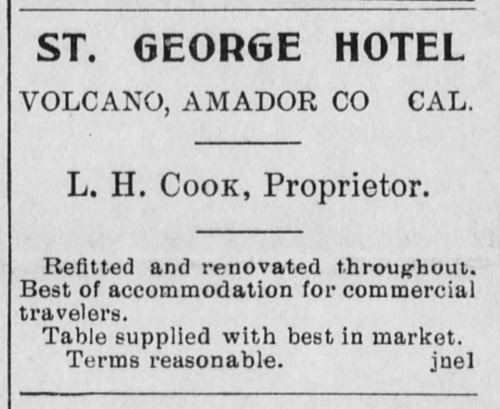 Louis H. Cook was a county supervisor and also owned the St. George Hotel in Volcano, California. If you stop in for lunch at Cook’s Station today, be sure to check out their great old photos of this historic spot, including this one, below! Cattle and what may be a hay wagon are waiting outside Cook’s Station circa 1900! Notice the churned-up dirt of the road. 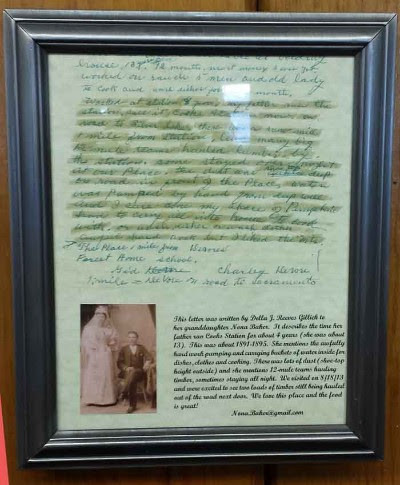 Letter from Della Reeves Gillick to her granddaughter, describing life at Cook’s Station when she lived there between about 1891-1895. Gillick recalls pumping water by hand from the outside well and carrying it into the house to do cooking or laundry. “I sure done my share of pumpin’,” she recalls. 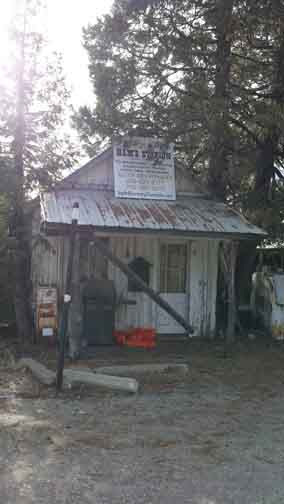 Ham’s Station, east of Cook’s on Highway 88, is another original stop along the old toll road. Amador historian Larry Cenotto notes that this site was originally Smith’s Hotel, built in 1863, and subsequently was operated by “Tulloch, Horsley & Co.” in 1864. 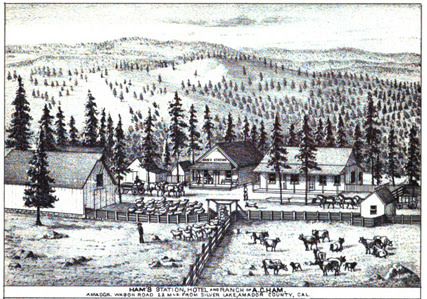 This etching shows “Ham’s Station, Hotel and Ranch” as it looked in 1881 (from Thompson & West’s History of Amador County). Note the welcoming accommodations for travelers with animals. In later, years, Ham’s Station was owned by W.E. Proctor, who sold it in 1900 to Joseph Dufrene for the sum of $450. In the early 1900s it went through a quick succession of managers, including John Votaw, Joseph Mello, and L. Mooney. Sadly, Ham’s Station was closed when we stopped by to snap this picture in late 2017. From what we hear, Ham’s Station has now been sold. We look forward to its newest incarnation! We hear that Ham’s Station has now been sold — kudo’s to whoever purchased this amazing bit of history! A special thank-you to historian Frank Tortorich for his kind assistance with this article. We also were pleased to find great information in Larry Cenotto’s wonderful “Logan’s Alley,” Vol. V (2006, Word Dancer Press), which contains much more about the history of the Amador-Nevada Wagon Road and the pioneering Amador families! Like to read more Sierra History stories like this when they come out? Sign up for our free newsletter at the top right of this blog page! A short copyright notice — We love that you love our articles, and we’re very generous in granting permission if you’d like to reprint them! However, please ask for permission before reusing our stories on a different website — and please remember to always give proper attribution. We so appreciate it!